Can we teach private international law through film? Yes we can, and not only through Green Card. Three sources in Spanish provide ample material, including some for non-Spanish speakers. 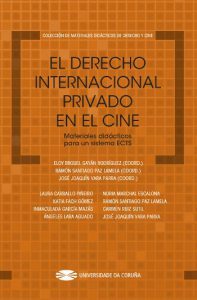 The first, most comprehensive and academic one, comes from the Proyecto DeCine, a network of Spanish law professors interested in teaching law through film. The result is a fabulous book full with detailed didactic materials on different films, which is also available for free online. Several of the films discussed are in English or exist in translation. Finally, MillenniumDiPR.com provides a rather eccentric list of ten private international law related movies with some unexpected themes: Titanic for international family law, The Martian for conflicts with Martian law, etc. Only for the daring. But all of this is in Spanish. Who has recommendations in other languages? Or who writes the guide in English? I guess that “The woman in gold” (Simon Curtis, 2015) is related to Private International Law. The story is about the “Portrait of Adele Bloch-Bauer” Affair, between Maria Altmann – a Jewish Austrian immigrant – that decided to recover from the Austrian government a great portrait made by his uncle, Gustav Klimt. The picture was stolen from her family by the Nazis in the Second World War. In this case, many issues of Private International Law arise, like “individual vs States litigation”, “access to jurisdiction”, “forum non conveniens”, arbitration, state immunity, and international traffic of cultural property. Many thanks for your comments. I am really very grateful with your kindness. In my case, certainly we will publish other five posts about Private International law in film, particularly, about maintenance, succesions, contracts, non contractual obligations and rights in rem. I keep at your disposal for any collaboration in this matter in English. That would be great!! To all those lists I would add “Under the Tuscan Sun”: for property rights in PIL (American woman buys immovable in Italy), international employment (Polish workers in Italy), family law (Polish guy marries Italian girl). I wish to add the old classic pre-war movie “Ninotshka” (I am not sure about the correct spelling), where a female Soviet official, played by Greta Garbo, was sent to Paris to sell, on behalf of the Soviet government, jewels confiscated by the communists in Russia. The pre-confiscation owner of the jewels, an exiled Russian princess, threatened to turn to French courts in order to recover the jewels. All this sounds very serious, but in fact the film is a hillarious comedy, highly recommended even after all these years.